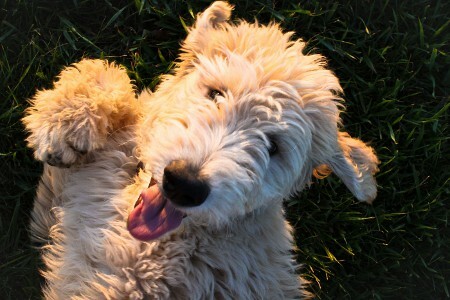 Welcome to our Yesterday's Goldendoodle Pups page! 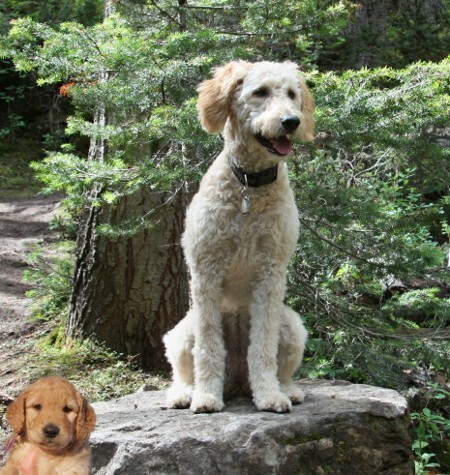 You may also want to see our newest pup info on the Yesterday's Pups page or some of our Doodle pups from previous litters on the Yesterday's Doodle Pups page. 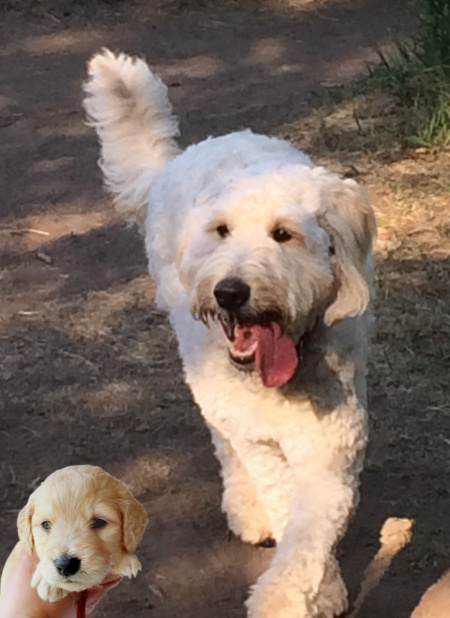 Lily (F1B standard Goldendoodle), and inset as Improv at 4 weeks, from Jam's and Brixx' December 2014 litter. I can't believe that Lily (Improv) will be a year old next week! She's an amazing dog and so incredibly smart! Lily loves her family and knows each one of us by name. Training her has been a breeze as she catches on so quickly. She's great with other dogs but she can be quite shy with strangers. We are working on building her confidence and she is getting much better. We love her sweet goofy nature! ...especially the way she tilts her head when you say something that she really likes. I would say that she's a medium energy dog. 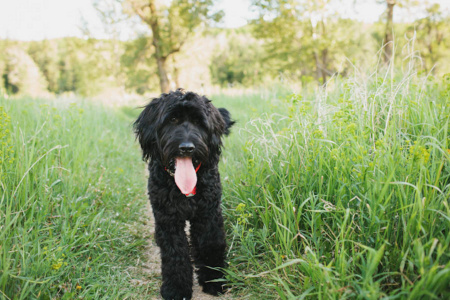 She loves her walks and loves to play with her friend Bella, who is a double doodle that we met at dog class. Lily loves water and, unfortunately, mud puddles. She also likes having a bath -- which is a good thing because she's had a lot of them. She's not much of a chewer, which is so nice (although she does really like toilet paper). Lily still has the stuffed animal that you sent her home with and plays with it often. There is nothing that warms my heart more than the way she greets us when we come home. It can only be described an an entire body greeting. Her whole body wiggles and for some reason she has to have something in her mouth while she's greeting us. Sometimes it's a toy but usually it's a shoe. Thank you so much for an awesome addition to our family! 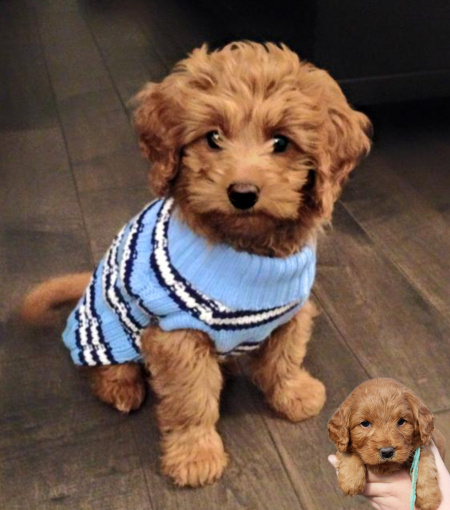 Tucker (F1B medium Goldendoodle), and inset as Nathaniel at 4 weeks, from Ginger's and Ryder's October 2014 litter. Just wanted to send you an update on Tucker, "Nathaniel," from Ginger's and Ryder's October 2014 litter. He is a happy, healthy, fun member of our family. Tucker has experienced a lot in one year. He has camped, fly fished, stayed in a hotel!! !, traveled to the USA and had some great puppy training and agility courses. The biggest thing is he makes us laugh and brings us together as a family. Thank you so much for breeding such wonderful family pets. We cannot imagine life without him. 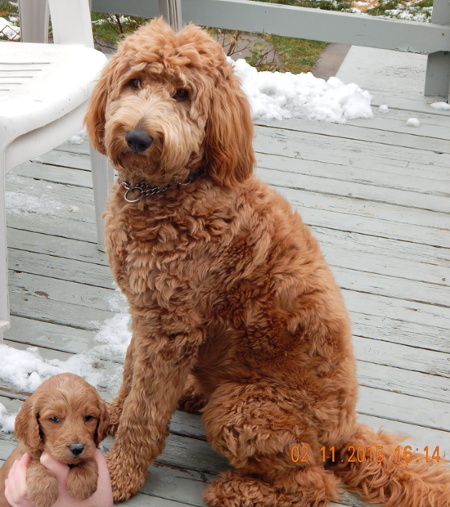 Chester (F1B medium Goldendoodle), and inset as Anthony at 4 weeks, from Ginger's and Ryder's October 2014 litter. I saw that you were breeding Ginger and Ryder again, so I thought I would share some pictures of what Chester (Anthony) looks like now, almost a year later. Chester is the sweetest dog. We get stopped constantly by people saying that they can't believe his colouring and just to play with him, which he loves. He loves people, a lot! He does have a ton of energy, so we put him into daycare once a week and generally take him for three good walks. He is an extremely cuddly dog and has grown to be about 23 pounds, but we think he'll be growing a bit more. We honestly can't imagine our lives without him. He has been an amazing addition to our family. Elsie (Standard F1 Goldendoodle), and inset as Piano at 4 weeks, from Kindle's and Dayo's June 2014 litter. It has been over a year since we adopted Elsie, AKA Piano, one of the 11 puppies from Kindle and Dayo. We just wanted to say a huge thank you. Elsie is absolutely beautiful and such a loveable goofball! She has grown (all 60 lbs of her) into a wonderful member of our family and is always ready to participate in whatever is going on. She adores all food (especially loaves of bread when she can get her paws on the groceries!! ), walks and swimming in the river, and is a best friend to everyone and every dog she meets. We have also have a mini schnauzer and they get on fabulously. Her presence has even helped him become less needy! We had quite a list of ideals when we were looking for a family dog; able to run distance, swim, retrieve, play soccer, be loving, cuddly, and willing to play dress up! Plus we also needed her to bond with our existing dog, be a protector (we live near woods and meet quite a lot of coyotes), and be hypo-allergenic. Elsie is all of the above and much, much more. Leia (Standard F1 Goldendoodle), and inset as Lucy at 4 weeks, from Shae's and Brixx' July 2013 litter. Although Leia ("Lucy" from Shae and Brixx's litter - July 10, 2013) celebrated her first birthday in July, we will again celebrate September 2 as the anniversary of the day you let us take her home. It has been such an exciting year for all of us as we witnessed the growth and changes throughout puppyhood. She has become a focal point of our family. Nothing is undertaken without the consultation of how Leia will be affected. We just adore her. Because of your advice and wisdom we were able to become responsible and responsive dog owners. The books you recommended, the philosophies they outlined, the guidelines they discussed, gave us insight as to how to successfully raise a puppy. We have had the benefit of 2 levels of puppy training from Jen at "Sherwood Barks" - as well 2 sets of classes in foundations for agility. 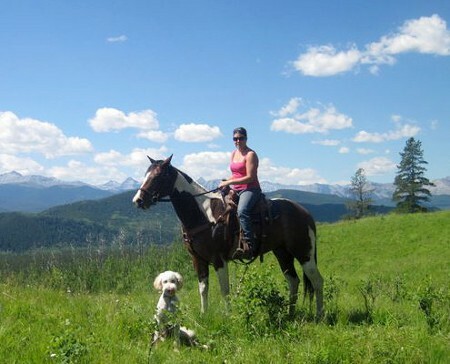 Jen's knowledge and skills in handling dogs and teaching owners how to behave and respond are exceptional. She has taught us so much. Leia is so well adjusted, so sociable with people and other dogs, so gentle, so playful, energetic and lovable. She is not yet perfect, but she is ours! We wanted to thank you again for giving us this wonderful puppy. She is the result of your high standards of breeding, your commitment to excellent health, and the support you give puppies prior to leaving their mother. 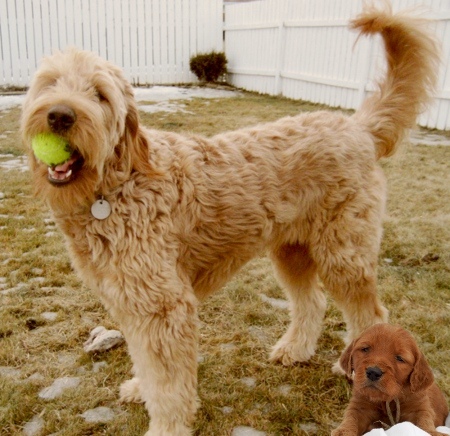 Jam (F1 medium Goldendoodle), and inset as Jacobs at 4 weeks, from Montana's and Horton's February 2014 litter. Jam (formerly known as Jacobs) is a dream! He's currently 45lbs and we just had him neutered. He's so sweet and friendly he has made a best friend out of our neighbour's dog Charlie. We take them both on walks and they play until they tucker themselves out. We've been taking Jam to training classes and he's been responding very well. He's gotten his puppy basics certificate and we're working on his puppy intermediate skills. Our favourite trick is when we put treats on his paws and ask him to wait until we say it's okay, and he does fantastic! Over the long weekend we all went camping down in Waterton, we went on some short hikes and took several dips in the lake. Jam also learned how to swim! He is pretty quick and looks like an otter floating around. Since picking him out Jam has totally come out of his shell. He has become very social - so much so that we're considering adding another dog to our family. Thank you so much for breeding our amazing dog. We are so happy with our choice and cannot imagine life without him! We get stopped constantly wherever we take him from people who think he is the cutest dog they have ever seen. 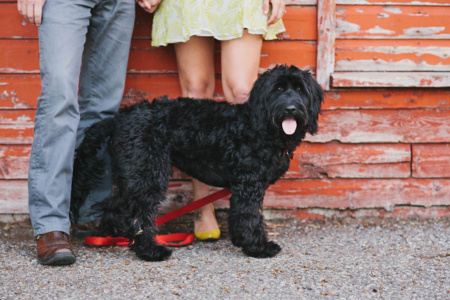 We tell anyone considering a doodle that Hearty K9's is the breeder to choose. Brianna's comments are for each photo, left-to-right and top-to-bottom. Thanks Brianna! Right from the start she was very social! I took her to school with me and my students adored her. 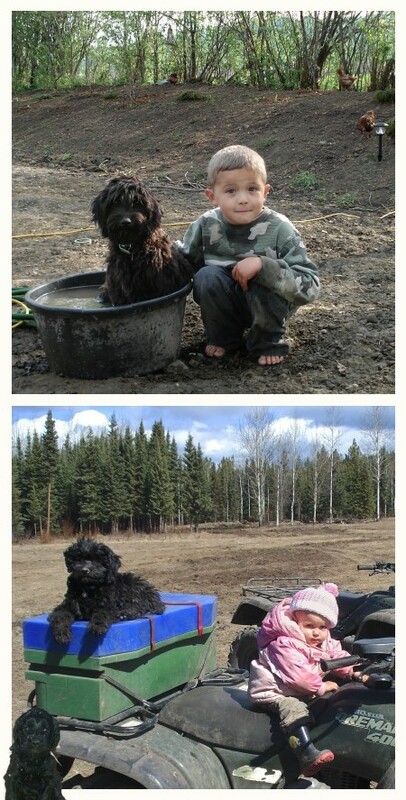 We had NO idea how much doodles love water... and even more, how much they love mud! She has had more baths in her first year than most dogs get in a lifetime! Starting to get her adult 'look' at 5 months. We took her to the cottage in Manitoba over the summer and she swam... and swam... and swam.. and swam. This is one of our favourite shots of her chasing her tennis ball into the lake. September 2013, with her adult coat coming in. Our Christmas card photo. Really hard to get her to stay still! Recently, her legs have sprouted! She hasn't gained much weight in the last 3 months, but she's gotten loads taller. She's now 53.5 pounds at 11 months. She cries and cries until we let her out into the backyard so that she can nap in a snowbank. This was during -25 weather. She LOVES the snow. In the summer she hogged the AC vent by lying right on top of it. Hard to get much work done with a doodle around! She loves kids and considers them her personal playmates! My niece's first words were "no Rhu!" Taken tonight. Still thinks she's small enough to fit under the couch! She is the funniest dog, and we love her to pieces. Thank you for a great family member! Autumn's and Dayo's April 2012 litter. 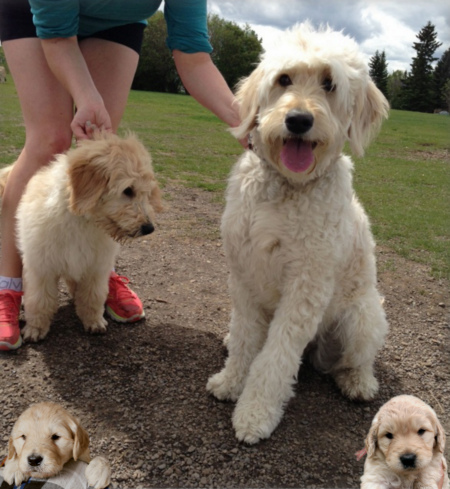 Today, at River Park in Calgary, we were walking Rhubarb (Arizona) from Autumn's and Dayo's 2013 litter. We ran into a dog that looked just like her! This is Kya (Fauna) from their 2012 litter. They were fast friends. Lorelie's and Rusty's June 2008 litter. It has been a long time since we sent an update and since I was browsing your website I thought it was due time. We have George Michael (Yule from Becca and Jag's December 2008 litter) and Maybe (Arrow from Lorelie and Rusty's June 2008 litter). They are absolutely the best of friends and have added so much to Andrew's and my life. Maybe ended up being the princess who rules the house, and George Michael turned out to be the sweetest, cuddliest guy around. He hasn't met a lap he didn't want to cuddle on! Recently, we began fostering puppies for a local organization and they are doing a great job showing these pups the way! We couldn't imagine our lives without them and are so glad we found you. I attached a picture showing them enjoying a tasty summer treat. It only happens once a year for a few seconds, and I think they probably look forward to it all year! I hope everything is going well with you and your family. 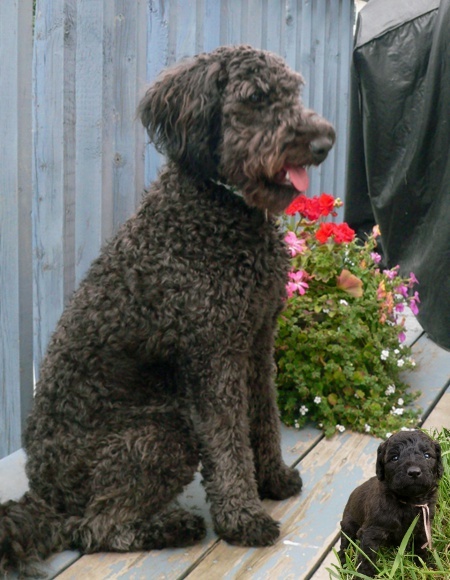 Buster (F1 standard Goldendoodle), and inset as General Custer at 4 weeks, from Peachy's and Dayo's July 2010 litter. 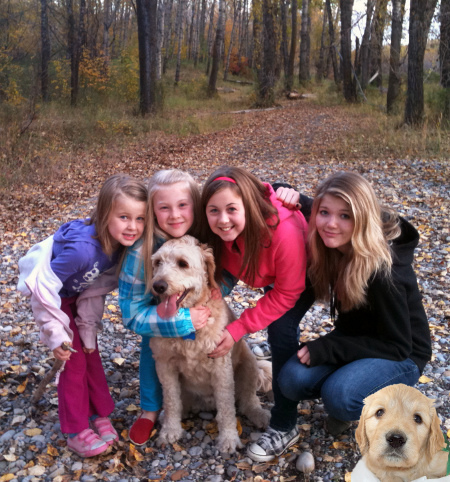 Taylor (F1 medium Goldendoodle), and inset as Fairytale at 4 weeks, from Beth's and Kodiak's November 2011 litter. I hope you are doing well. I wanted to let you know that Taylor, AKA Fairytale is doing great! She celebrated her first birthday on November 3rd and her weight on November 5th was 30.4 lbs. She has the sweetest personality, is fun and energetic, but has her times when she loves to snuggle. Taylor thinks she is a lap dog. Her favourite things to do are; retrieve the ball, play in the snow, and swim. She can open the garden door -- the only problem is she does not shut it when she comes back in the house. Taylor sheds just a little but if I brush her every day, almost none. In the photo where she is showing her profile she has had a recent hair cut. All my friends and family just love her -- even the one person who is not a huge dog fan loves her. She does get in trouble when she eats my socks and towels, besides that she is perfect. 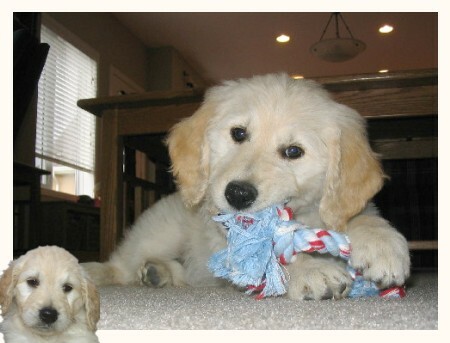 Buddy (F1 standard Goldendoodle), and inset as Franklin at 5 weeks, from Peanut's and Dayo's November 2008 litter. Just wanted to touch base with you after all these years... we adopted Franklin back in February of 2009, and have since named him Buddy. We were the couple who had the 4 daughters from Canmore. Anyway, Buddy has been the BEST dog ever, and we love him to pieces! Our four daughters cannot imagine life without their dear Buddy!! He is so smart, so affectionate and fun; the perfect family pet!! I wanted to attach a few pictures for you to have for your album, if you'd like. Thanks again for giving us such a wonderful dog!! 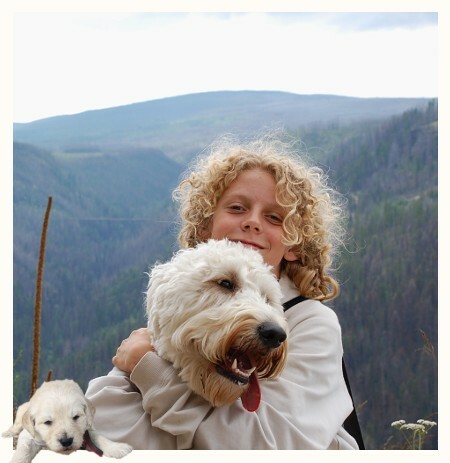 Teddy (F1 medium Goldendoodle), nee Frosty, from Beth's and Kodiak's November 2011 litter. 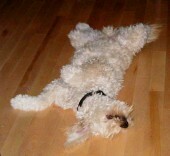 I just wanted to send a few pics of our puppy we got from you at the end of December 2011. Our pup's original name was Frosty and we named him Teddy! Teddy is 7 and a half months old and he is the best thing that happened to my husband and I! Teddy loves to cuddle, chase balls, play with other pups and is just a wonderful dog with the BEST personality!! Teddy is just over 35 pounds so he might grow a bit bigger. Again, thanks for a great doodle! 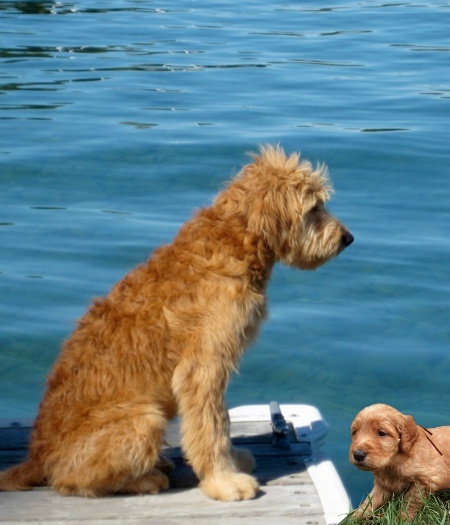 Surly (F1 standard Goldendoodle), and inset as Biffy at 4 weeks, from Peachy's and Dayo's July 2011 litter. Surly is now 6 months old and we thought we would email you with an update and a few pics! Surly has been a great addition to our family. He is a gentle, playful dog, and is doing well with his obedience classes. Little did he know that when he came home with us he would get to be part of such an active lifestyle... he absolutely loves snowshoeing and x-c skiing with us. He knows that when it's time to go in the car it's usually for something very fun, and he is great at just chilling until we get to our destination. Surly has even started wearing a pack so that he can carry his own food and treats! We've met a few other dogs from your past litters and he has become good friends with his half-brother Turner (also fathered by Dayo about 5 years ago). Thank you for allowing us to bring home such a great companion! Bubba (F1B medium Goldendoodle), and inset as Lemonade at 6 weeks, from Bella's and Horton's August 2010 litter. After our first year with Bubba (formerly Lemonade) we thought we would send you an update on how she is doing. She has grown to be 30 lbs. Her coat is very curly and she does not shed at all. Her colouring has gone from black to a really pretty chocolate brown, with a cute little patch of white (on her leg and on her bum). Bubba is extremely smart (sometimes too smart for her own good!) and was easily trained. She is very athletic and loves to run, and is a fool for playing catch... she would easily be able to play shortstop for any team in the National Baseball League!! We spend our summers at a cottage and we were thrilled that she not only loved the water and swimming but was a natural diver (loved to jump off the dock!! )?.all ducks beware!! She has a really sweet personality, full of lots of love and kisses for all family and friends. Bubba is pure joy and we can not imagine life without her. We are contemplating a new little sister for her next Fall. Thank you. 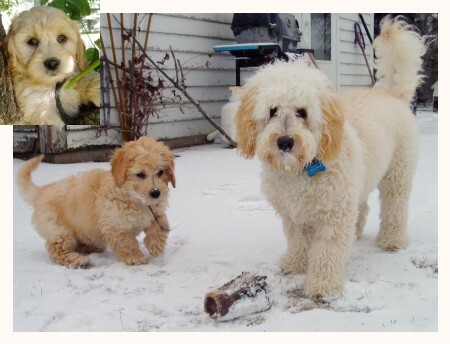 Ginger (Standard F1 Goldendoodle), and inset as Curling at 4 weeks, from Peanut's and Brixx' January 2010 litter. These pictures were taken on Ginger's first birthday. Ginger is a wonderful dog who is very loving and is full of playful energy. She is very social and absolutely loves spending time with other dogs. Ginger adores people and is always eager to greet everyone on our walks. With the exception of pulling to greet people while we are walking, she has been very easy to train. We are constantly trying to come up with new tricks for her and games to make her think because she is so eager to learn. Ginger is 60 lbs and a minimal shedder, just as you predicted. Ginger has been the perfect addition to our family. Thank you so much. Buster (Standard F1 Goldendoodle), and inset as General Custer at 4 weeks, from Peachy Keens' and Dayo's July 2010 litter. Just thought I would send an update now that Buster (General Custer) is over a year old. He's doing very well and is a joy to have around. Buster has grown into a very big boy! (65lbs) but is gentle and playful. He doesn't shed and his coat is nice and wavy when it's long. He attracts a lot of attention because of his calm composure for being a puppy and how darn cute he is. Buster is so smart, always doing tricks and listening to commands. He is an excellent dog. He had his first camping trip this week and enjoyed the outdoors and being with his people. Again, our families were impressed by how well-behaved Buster is. Thank you so much for the perfect dog! 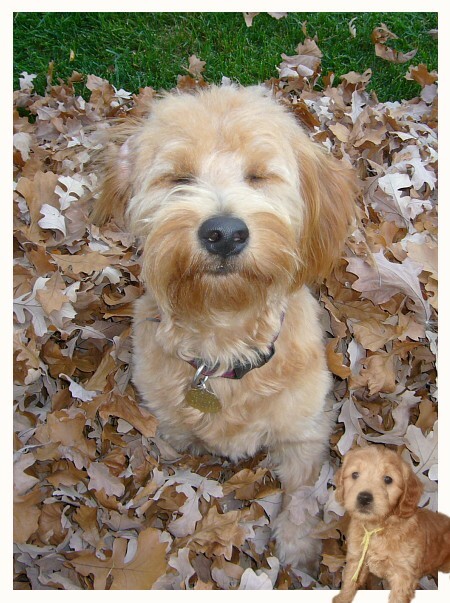 Padme (F1B Medium Goldendoodle), and inset as Soda at 4 weeks, from Bella's and Horton's August 2010 litter. Hi! It has almost been a full year since Padme (formerly Soda) was born - we can't believe how time has flown! She has grown to be about 35 lbs just as predicted, and almost no shedding. 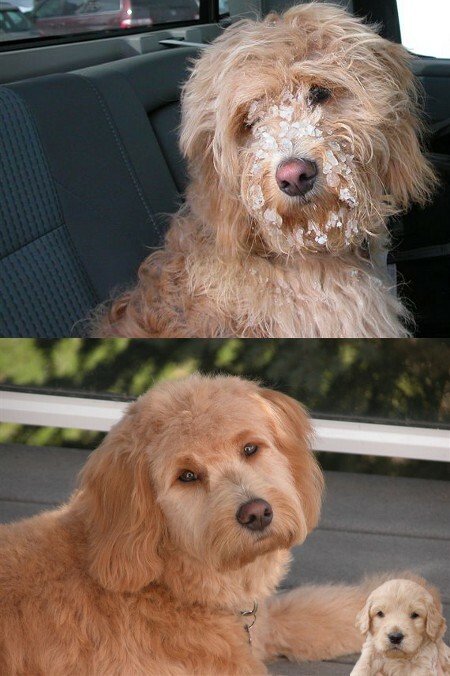 Her coat became fully curly, with wavy at the tail and straight around the face, after the first shave. She has become a wonderful dog for our family and well-adjusted to all the children and our busy home. She has such an obedient, gentle, nature everyone has come to love - including on occassion our remaining cat!! We are continually amazed how fast she catches on to new commands or training - only took one turn out on the bike for her to learn to jog beside it. As you may recall one of our primary concerns was allergies and we are very happy to report absolutely no hint of any to date - even when she's been playing around things that may cause a reaction. Thank you once again for the precious addition to our family. Enjoy the photos! 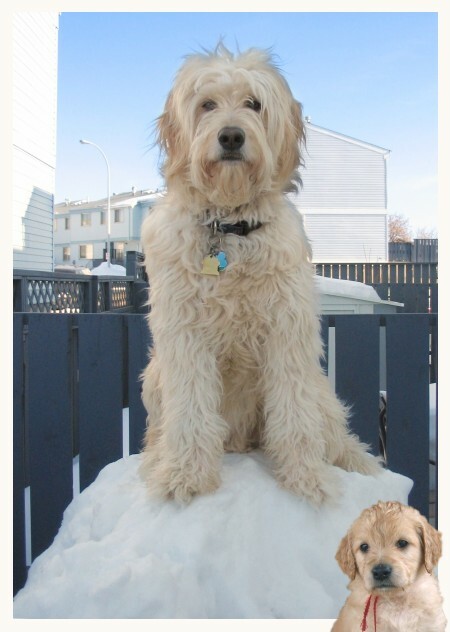 Rufus (Small Standard F1 Goldendoodle), and inset as Mogul at 4 weeks, from Maple's and Brixx' April 2010 litter. Hi Sonia! I know you like seeing your puppies all grown up. I couldn't decide what pictures to send you so I sent a bunch. We absolutely love Rufus, he brings us so much joy. He is such a funny guy and so unbelievably athletic, he runs circles around everyone! One of the things we struggled with was his summer haircut so I'm sending before and after pictures so others can perhaps have ideas of what they do and don't like. We are looking forward to adding to our pack. We get closer everyday as Rufus matures and shows signs of being a healthy, happy pack leader. The picture with two dogs is Rufus and Sully, taken just one month ago. We are so lucky to have Rufus's brother in the same town and are able to spend time with him too. Will be in contact again when we are ready, in the meantime I visit your website alot just in case we spot our next dog! 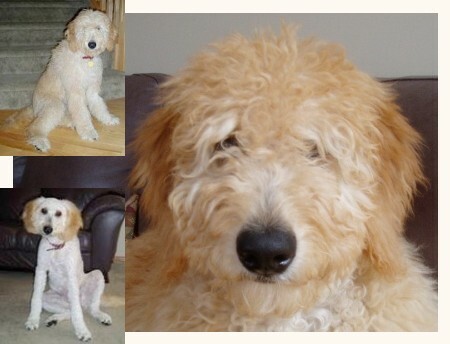 Molly (Medium F1B Goldendoodle) at 7 months, and inset as Smoothie at 6 weeks, from Bella's and Horton's August 2010 litter. It has been a few months since we have picked up our little Molly. I thought I?d send along a picture to show you how she has grown. She is almost exactly the size you predicted (40 pounds), which is exactly the size we were looking for. She has grown into such a sweet puppy with a kind and gentle character. Molly does have her moments of stubbornness too ? but they only make her cuter. You may notice that as she has grown she has gained some brown colouring around her nose and on the fronts of her front legs ? an interesting addition to her appearance. She is so loved, and I cannot imagine how we managed without her ? she is our very sweet Molly. 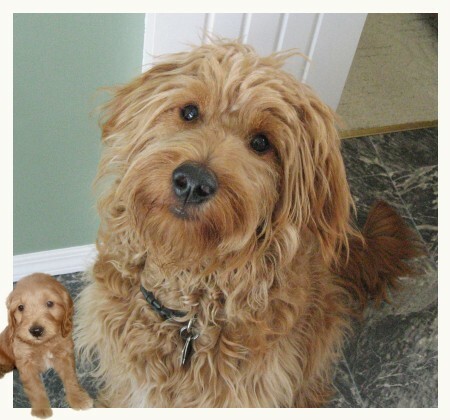 Max (Miniature F1B Goldendoodle) at 1½ years, and inset as Hectare at 4 weeks, from Lorelie's and Rusty's June 2009 litter. This is Jennie Hunt. 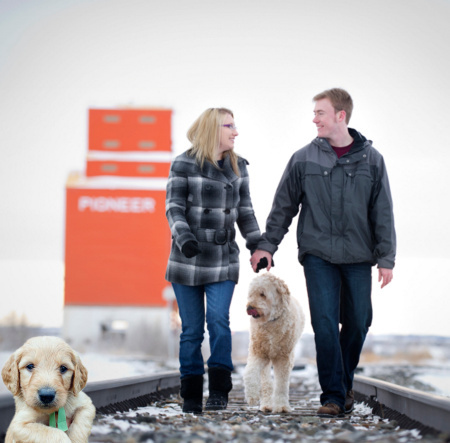 We met in the summer of 2009 when my husband and I picked out "Hectare" from Lorelie's and Rusty's litter. 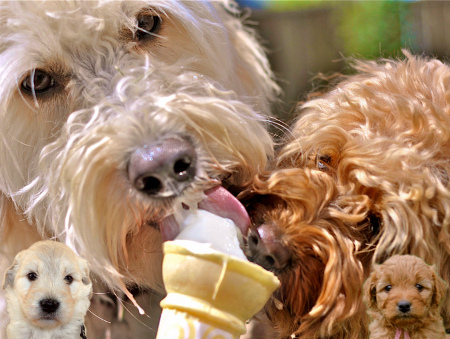 I also suggested a few friends of mine to get a goldendoodle from you. You just sent "Rex" to our friends in New York! Rex is doing great by the way... they couldn't be happier! "Hectare," aka Max, is the most amazing dog. We are totally in love with him. He is SO well behaved and has become quite the lap dog in the last few months. Every time we are on a walk, vet, dog store, road trip, Max is adored by all who see him. The other day we were in the car and stopped at a red light and I looked over and the person in the car next to us was taking a picture of Max with her cell phone!!! I told her what kind of dog he was and she just thought he was the cutest thing she's ever seen! When we picked Hectare/Max out he was definitely the most hyper of the litter. His playfulness is still present but he now knows when to "turn it off." He is FANTASTIC with children. He loves kids... never stops kissing them, let's any child hug him, pet him, and give him treats. He is so gentle... when he is offered a treat, he licks it out of the persons hand instead of grabbing. He loves to go for walks and loves to play in the snow. Max is also a very healthy boy. Originally you predicted he would weigh around 35 lbs... he only made it to 26 lbs! Its actually perfect for us. We love his size. Max has never shed a day in his life... which again, is perfect for us. We have had to board him a couple times and he is always a rockstar. The people who watch him don't ever want him to leave. All and all, he is the perfect dog. I'm writing you because Jamie (my husband) is still playing hockey in Chicago for the Chicago Wolves and every month they have a magazine with articles about what's going on with the team. This month they decided to do a story on hockey players and dogs! They chose to put Jamie and Max on the cover! I just got a couple of pictures back that I thought I would share with you. I hope you enjoy. Again, we couldn't be happier with Max. He has brought such joy to our lives! Qanniq (a Standard F1 Goldendoodle) at about 9 months, and inset as Cleaner at 5 weeks, from Yankee's and Dayo's January 2010 litter. We thought you?d like to see how Qanniq (Cleaner was his kennel name) is doing ? here are a couple of photos taken in the late summer and early fall. As you can see, Qanniq has grown into a big boy. He is quite the character ? he just loves being outside and is really enjoying the snow. He travels well back and forth between our home in Calgary and our second home in Fernie. He is a wonderful dog. Thanks for producing such an excellent pup! 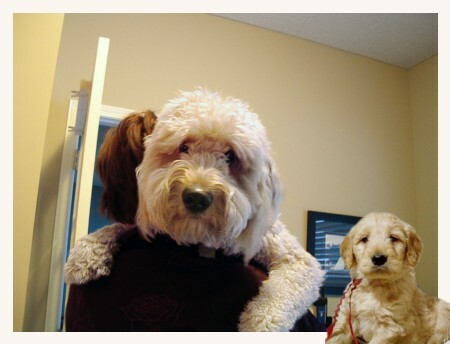 Penny at 10 months (Standard F1 Goldendoodle), and inset as Biathalon at 4 weeks, from Peanut's and Brixx' January 2010 litter. Just thought I would give you an update on Penny (Biathalon). She has been a wonderful dog! Very affectionate and playful. She is loving the off-leash area we live near and can run like the wind. Unfortunately she doesn't look where she is going sometimes and has run into a few trees, and my legs on occasion. 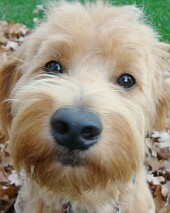 We have met more and more owners with Goldendoodles, and lots who have purchased their pups from you. Keep on doing what you do, seems you have a winning combo! Tomy-Amaryllis (Mini/medium F1 Goldendoodle) from Becca's and Jag's December 2008 litter. 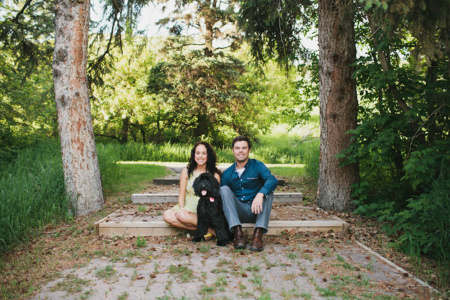 I just wanted to send you an update on our dog Tomy (formerly Amaryllis), from Jag and Becca. 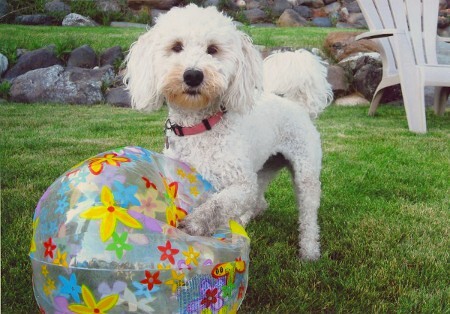 I have attached a photo of her this summer in Kelowna. Tomy is doing excellent. We adore her. We're constantly amazed at how well she fits into our family and what an important part of it she is. She is a very smart dog and is only limited by our lack of ideas or direction. This year she and my husband Jason took up agility. We find she's happiest when she is working and pleasing us. She loved the classes and caught on very well. Tomy is quite agile and athletic even though she is small (29lbs). The best part is when she completes something she looks to the crowd for praise and acknowledgement. Tomy is the kindest dog around and has never showen any signs of ill temperament. She loves to be near people and makes everyone that meets her feel great. We constantly are told how she "smiles". Tomy is quite the swimmer and loves to chase anything that moves, however, her favourite pastime is playing with her sister Sandy... oh and, of course, getting her belly scratched. Thanks for giving us such a great dog who is so well-suited for our family. Cooper-Star (Standard F1B Goldendoodle) from Bella's and Dayo's August 2009 litter. I think Cooper has a VERY happy life with us. Our 3 horses are his very best friends so he gets out lots to run in the fields and arenas with them. 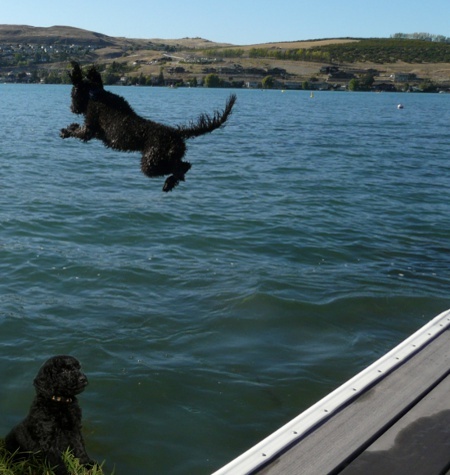 We have a fabulous dog park in Calgary that is along the river so he gets out to play and swim there lots. He is VERY attached to us and goes most places with me. Whether it be to the barn, to my office, camping, rafting, rides out in the hills with our horses, and of course, the dog park. Cooper has a phenomenal temperament (although quite shy with strangers) and once he has warmed up to new people he is very affectionate and loving. He does incredibly well with other dogs of all sizes and breeds and is so gentle with small dogs and children that it is amazing. I have attached a few photos of him and I can send more if you would like. Sandy-Poinsetta (Mini/medium F1 Goldendoodle) from Becca's and Jag's December 2008 litter. Sandy (Pointsetta) is an amazing dog. She loves to sleep with us, but changes beds so she can sleep a bit with everyone. We've taken her to Kelowna; if she?s with us she?s happy. Sandy totally fits in. She's lazy-playful, funny and sleeps in! She is perfect! Sometimes friends say they want a dog, but not just any dog... Sandy. She is the perfect addition to our family. Sandy is laid-back and loves people. We all love her. 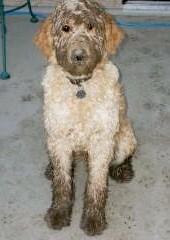 Sully-Card (Standard F1 Goldendoodle), at 4 months from Yankee's and Dayo's January 2010 litter. I hope you remember me. I'm the famous police officer that was on tv, remember? Card, aka Sully, is really doing well... he is massive!!! He's very clever and has taught himself many tricks. We're very happy with Sully as he has blended into the family well. 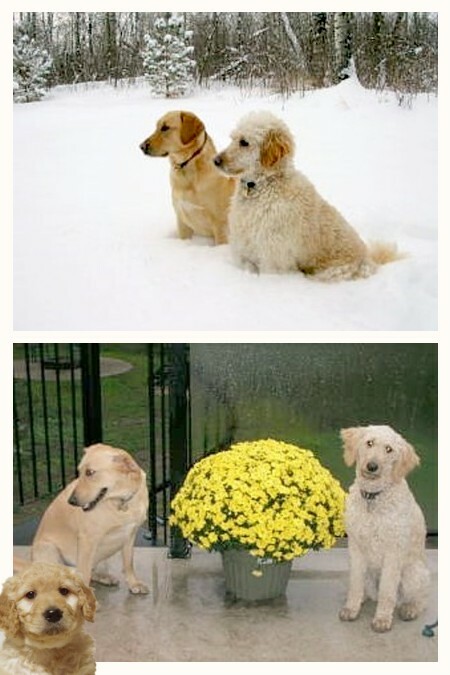 Jake-Tetris (Mini F1B Goldendoodle), before 7 months (top) and after 8 months (bottom) from Misty's and Kodiak's August 2009 litter. I hope this email finds you and family well - was on your website and couldn?t help noticing Jake?s photo in ?Tomorrow?s Pups? page. As you recall Jake, formally know as Tetris with Kodiak & Misty?s 2009 litter has developed into the ?perfect dog? for us as a family. Looking back I was very impressed with your skill in choosing Jake based on our criteria which we sent you. Jake has almost finished his obedience class and doing very well - although at 8 months he is in his ?teenage? stage where lots of reminders & patience are required. Jake is currently around 32lbs - and we will see if he gets any much bigger, but honestly he did turn out to be the perfect size - he loves the outdoors and has just recently started to recognize his love for the water. Jake has experienced much travel (Vancouver, Jasper, United States) and will be joining us this summer to Yellowstone National Park - he again has turned out to be an awesome traveler! More importantly, the rewards have out-weighed the challenges particularly with our 14-year old son - Jake and Ryan have a great relationship; not to mention that the added responsibilities seem to be a pleasure, as opposed to a chore when it comes to Ryan tending to Jake?s needs. Here are a couple of recent photos we've taken - before the first haircut, and after. 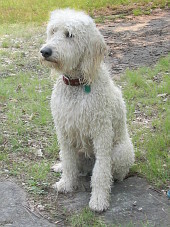 Ruffin (Mini F1B Goldendoodle), at 9 months, aka Jigsaw, from Misty's and Kodiak's August 2009 litter. Our family is now well underway with Ruffin in our lives. We can?t imagine life without him. He is walked at least once a day and has quickly become a minor celebrity in our neighbourhood. People have pulled over to ask about him and some even stopped traffic. When walking on the paths down in the Calgary river valley Ruffin brings a smile to everyone he passes. We have had no problem kenneling him and he recognizes it as a safe haven for sleep and travel. When he?s tired, but feels he needs to stay in the action, he climbs onto the lower shelf of one of the end tables in the living room and watches ankles go by. Training Ruffin to do his business outside was very straight forward. We have a bell on a string on the backdoor knob and he rings it with his paw when he needs out. He figured this out in his second month with us and is very consistent at this point. Just in the past weeks we have started working with him off his leash in open fields away from streets and he is doing very well in that environment. He stays close and comes when called. Environments he?s comfortable with, such as at home, his recall is 50/50 ? we?re working on it. Ruffin is a very well behaved dog, who loves people and has an uncanny knack of keeping himself occupied when need be. He has a very gratifying welcome and we are so glad we got him. He is healthy, happy and a joy to be around. 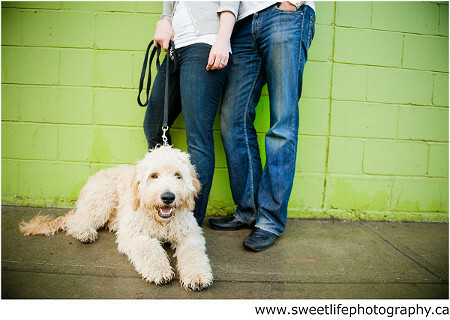 Norman (Standard F1 Goldendoodle), at 9 months, aka Legend from Peachy Keen's and Dayo's December 2008 litter. This photo is where Norman joined Darren and I on our engagement photo session. I just wanted to give you an update on our pup Norman, formerly Legend of Peachy's and Dayo's litter. His coat has become quite wavy and has stayed a light cream/apricot colour. He is just as heavy as you had warned us, weighing in at a solid 66lbs! Even still, he's pretty sure that he's a lap dog. Thanks for such a wonderful dog, we really enjoy having him! 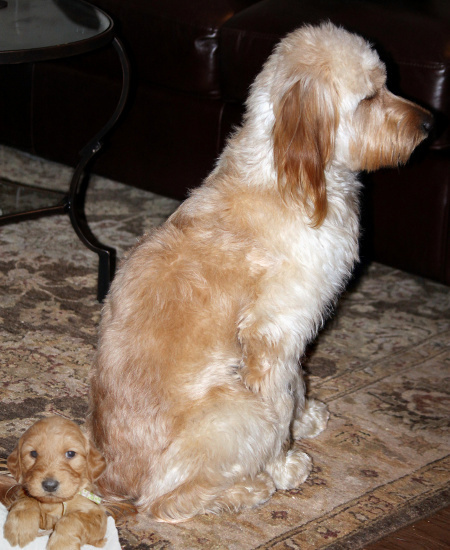 Katie (Standard F1 Goldendoodle), and inset, as Parable at 5 weeks, from Peachy Keen's and Dayo's December 2008 litter. At 8 months Katie is a svelte 40lb, non-shedder. She still has great energy and loves to play. At the dog park she?s always seeking out other dogs to run or wrestle with, while at home she expends a good deal of energy trying to engage whoever isn?t busy in some sort of game. We?ve even run into a couple of other Hearty K9 pups including Maple and one of the reindeer (can?t remember the name). Katie loves walks and especially getting out for long hikes on the weekends. She is also quite the water dog ? both swimming in the river and trying to join me in the shower every morning. We both think it?s funny that she?s not a morning dog, preferring to sleep in until 7 when I get up, rather than go downstairs with Carol at 6. Katie is also the first dog either Carol or I have had that you can free feed. It seems unnatural to have a dog walking past a full food dish for an hour or two until she decides to eat. We really enjoy her silly character, intelligence and energy. And, in spite of the poodle nose, she?s quite cute. Molly (Standard F1 Goldendoodle) and friends at her 1st birthday party, aka Pearl, from Nia's and Dayo's March 2008 litter. I just wanted to say thank you to everyone that contributed to Molly?s 1st Birthday Party yesterday. It was a huge success, Molly had so much fun and greeted everyone with her usual happiness (and happily no pee). We could have used more humans to help remind the pups to stay in their chairs until we served the cake, but the dogs didn?t complain about the extra lick marks on the cake -- it?s all good to them. It was unbelievable the loot of birthday gifts Molly got. She'll be outfitted with treats, toys and bones for a long time to come. Everyone was so generous. I didn?t even know you were supposed to bring gifts to a doggy party! I have to say it was the easiest party I?ve ever thrown. I didn?t have to clean before they came and the guests ate and partied without complaint. I just love it when everyone has a good time and this party sure made a lot of people laugh! 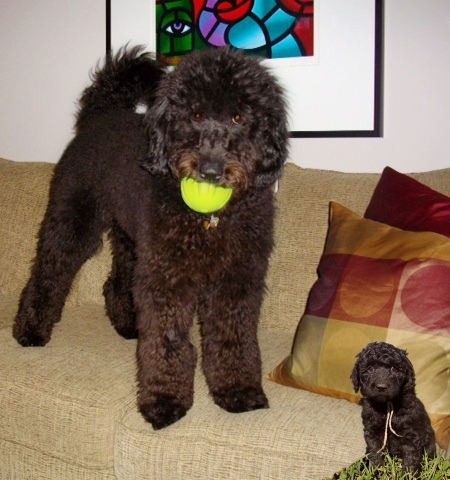 Kairo (Standard F1 Goldendoodle), at less than 2 years, and inset, as the Incredible Mr. E at 3 weeks, from Nia's and Dayo's March 2007 litter. Well, Kairo (incredible Mr. E), will be two years old in March and it is absolutely amazing how much he has become a part of our family. 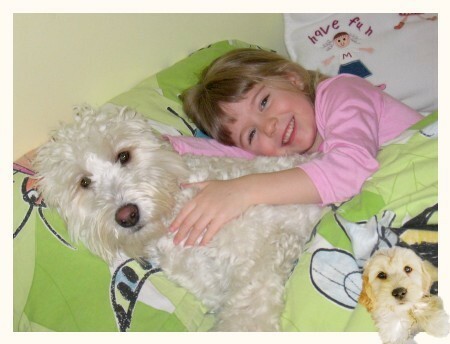 The kids just adore him and right from the start he has been just a great dog for children. He's a great size for us (75 lbs) and loves to go on hikes and runs with us. As you can see in the pictures, he figures prominently in our lives and vacations. Everywhere we go people gush and rave about how great he looks - and we agree with them! He does have an appetite for socks, which has cost him some pain and discomfort and us a few dollars! But we seem to have solved that habit. Until recently he would not bark AT ALL. Only in the last 4 - 6 weeks has he begun to bark when someone comes up the walk or into the yard, but still there will be many days or even weeks where he will not bark. When he does bark, he certainly makes an impression on people though! 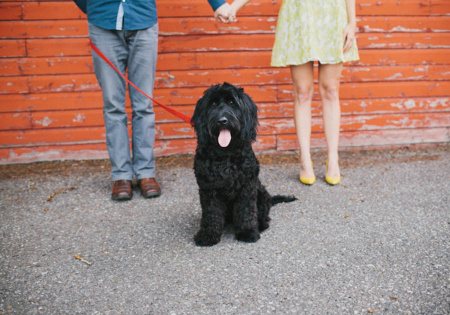 Without a doubt a Goldendoodle was the right choice for our family. From the lack of shedding to the playful nature and agreeable temperament, he's been perfect for us. Thanks again. 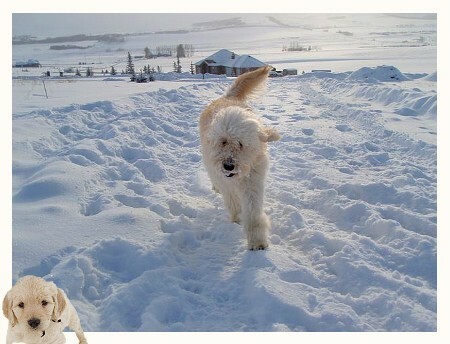 Zeke (Medium Standard F1 Goldendoodle), at about a year, braving a bleek Alberta winter, and inset, as RifRaf at 5.5 weeks, from Sheena's and Dayo's January 2008 litter. Hope that you and your family are doing well. I've sent you a few pictures of Zeke (RifRaf) now that he's a year old. He had a great first Christmas and is loving all of the snow this year. He's a happy, healthy 50lbs. 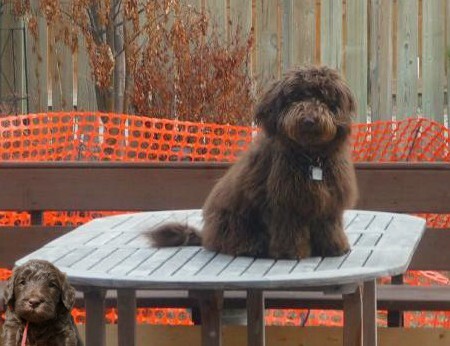 Hudson (F1 Goldendoodle) sitting on his dog house, at 1 year, and inset, as Ian at 6 weeks, from Nia's and Dayo's March 2007 litter. Hope all is well. I cannot believe that Hudson (Ian) is one year old. Hudson weighs about 60 pounds and is approximately 25" tall (to his shoulders). Even though he is quite the cuddler he is very protective of our place as he growls or barks at every vehicle, person, or unfamiliar noise that he sees and hears. At the same time though he is a very social dog. Hudson loves the dog park and meeting new people and he is always up for a car ride. Hudson was neutered when he was 6 months with no complications and he also graduated from a Level 1 obedience class in November. We are still working on his heeling, but he sits, lies down and stays verbally or with hand signals. Hudson's coat is more like a golden retriever's, but it's still thick and woolly (see attached pictures). 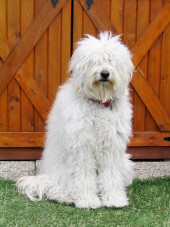 He is a shedder, but the loose hairs usually come out when he is being brushed or when his hair is wet. His back, ears, tail and the back of this rear legs are still apricot in colour, but the rest of him is white. We are planning on getting him clipped in the spring and were wondering if you have any recommendations for a groomer? Fort McMurray only has a few groomers and most of them aren't taking any new clients, so we'll have to take him to Edmonton. Hudson is a handsome dog with a great personality and has lots of kisses to go around. He will definitely miss the snow when it melts as he loves to do somersaults in it. 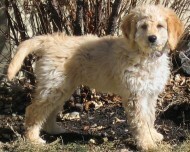 Willow (F1 Goldendoodle), almost 2, and inset, as Ariel at 6 weeks, from Nia's and Dayo's March 2006 litter. I just thought I would send an update on Willow (Ariel) now that she is almost two. We can't believe how incredibly wonderful Willow has been! From the beginning she was a vary calm and obedient girl. She took to training very easily and responds to hand signals or voice commands immediately. Our friends can't believe how good she is, considering she is so young. We had a big move last year from Calgary to Oakville, Ontario. Willow really enjoyed our summer exploits into cottage country - she loves to swim and boat! We let her hair grow for the first year to figure out what we were going to get, and we discovered (when she had hair six inches long) that she doesn't shed but does need to be clipped. One picture shows Willow pre-clip and the other post-clip (on the side bar). She looks like quite a big dog. Willow is tall and lean but weighs in at a svelte 46 pounds. Her hair makes her look much larger! It seems strange that she is so light, because she is a very good size, but she eats well and the vet says she is in great health. We love her size - not too big and not too small! 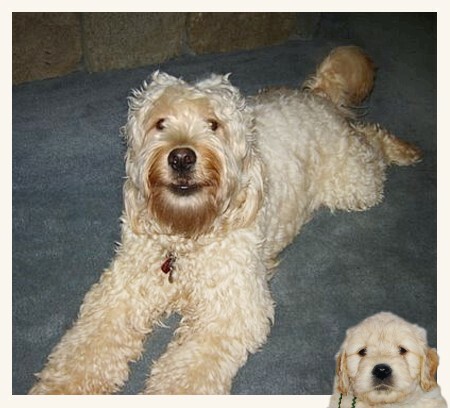 Casey (F1 Goldendoodle), 1 year, and inset, as Stuffy at 6 weeks, from Zoey's and Radar's September 2006 litter. We realized today on Casey's 1st birthday that we have never sent you pictures of her all grown up. If you need reminding, Casey (aka Stuffy) is from Zoey and Radar's 2006 litter. 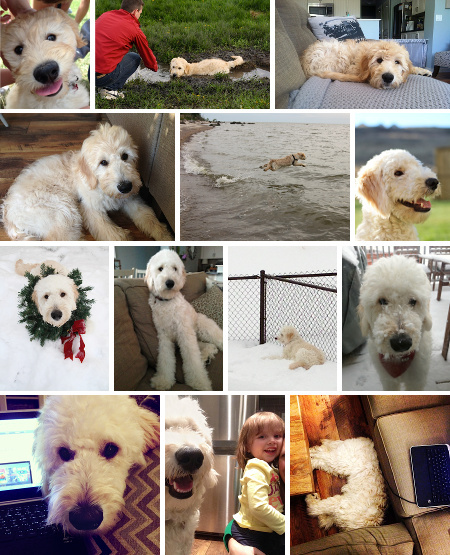 We've attached a couple photos of our best friend for you to see. This pup is night and day from Emma (which was one of Sally's). She looks nothing like her, is very relaxed, but is a shedder. Casey looks like a miniature red Retriever and is weighing in at about 25lbs. Casey was able to spend all summer at the lake and has turned into a very social dog and loves to play with any and all dogs. She also loves the water whether she is fetching sticks, chasing ducks or going for a Sea-Doo ride. We receive endless compliments on her and refer you to all who ask. Thank you again for helping us through our difficult time last fall when we lost Emma and were considering a new pup. She has been a great addition to our family. 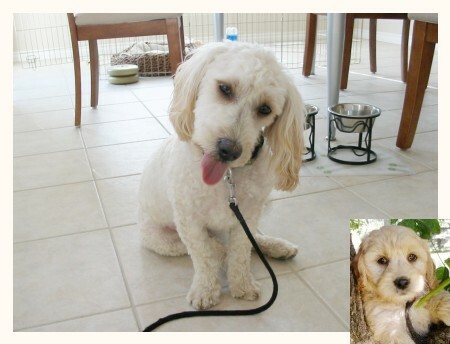 Will (F1 Goldendoodle), at 1 year, and inset, as Leaf at 6 weeks, from Zoey's and Radar's September 2006 litter. Well, it has been almost a year since we brought Will (Leaf) home. In that year he has become an awesome addition. He is gentle, super intelligent and full of love. From the day we brought him home he has been nothing less than a joy. We have not been able to walk him without interruption from day one, everyone wants to know what he is and where he came from. And, the more people get to know him, the more they like him. I have had to forward your website on to so many people I have been tempted to just put a sign on my back with the website. People have actually run out of their homes after the children to find out about Will. Even our vet had friends phone me to talk about Will and where he came from. He is one exceptional pup. If every dog was like Will every person would be a dog owner. The attached pictures are only that... we all fell in love with his looks but remain in love because of his personality. Good breeding has wonderful results. Thank you Sonia. 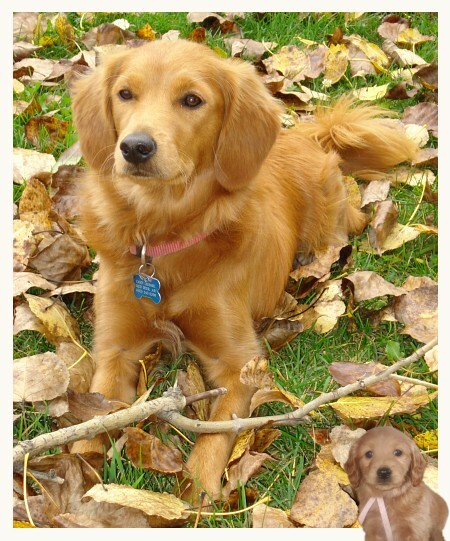 Annabel (F1 Goldendoodle), at 1 year, and inset, as Autumn at 6 weeks, from Zoey's and Radar's September 2006 litter. Hope all is well. I cannot believe it has already been one year (well almost) with Annabel (Autumn). She is such a joy and has a really funny personality. Even though she only weighs about 25 pounds and stands about 18 inches, she's likes to be the boss with her big brother, Oliver. Annabel is quite the cuddler and will still make her funny noises when she wakes up in the morning or wants attention. We have done some obedience classes with her and she picks up on tricks and commands very easily. She also loves to roll in the sand and dirt, and will take every opportunity to go swimming in the lake. She really does have a great life! After about 7 months she finished shedding her early puppy coat. She no longer sheds, which is great for us with allergies. Everyone thinks she is the cutest thing (I always agree) and many have asked where I got her. Perhaps they will be future doodle owners too? I just wanted to write and let you know that things are great with Annabel. I have attached a couple of pictures so you can see what she looks like now. She just had her hair done so she is looking quite proud. 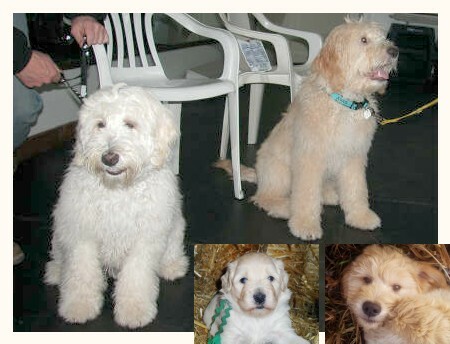 Daisy (F1 Goldendoodle), at 5 months, and inset, as Gloria at 4 weeks, from Sally's and Toby's January 2007 litter. I just had a couple of minutes and thought I would send some pics. Daisy is wonderful and has calmed down alot. No more nipping and yiping, and she rarely jumps up too! Training is smooth and easy. Daisy is a quick learner and enjoys her sessions. She loves water. I have the kids in the calf sled while planting and for some reason Diasy figures its her pool too. Cannot blame her since its been 30 above recently. I just filled a tub with drinking water for the dogs, but it too is her personal pool. Anyway, Daisy is now 15" and is getting more white hairs throughout her coat. Her muzzle is turning a rich chocolate brown and her body is looking to have more of a brown tinge too. Wonder what colour she'll end up????? Full of beans Reilly (F1 Goldendoodle), and inset, as Edmond, from Sally's and Jag's December 2005 litter. Thought you'd like to see a picture of Reilly (Edmund). He is still full of beans and we love him this way. Only problem is that we are having a hard time outsmarting him. Due to his supreme athletic skills, he has been able to climb a 12 foot high stone cliff which is part of his enclosed space! He's not escaping to roam, just to see if he can find us. He loves the water and will just play and splash in every puddle if given the chance. Too cute for words! 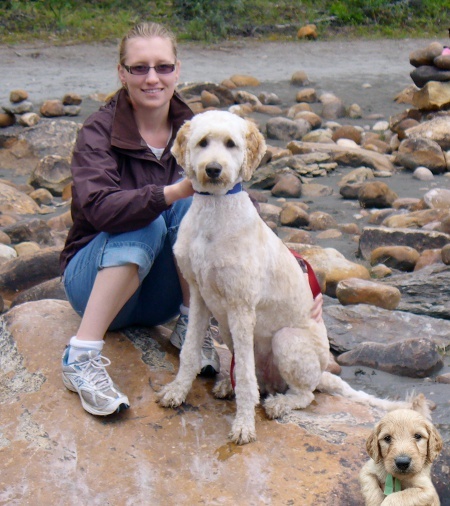 Syd (F1 Goldendoodle) with Lucy, and inset, as Joy, from KD's and Dayo's December 2004 litter. Here are a few choice pictures of our Sydney (some with Lucy the lab!) Syd is 54lbs, the same height as our 75lb lab, although with much finer bone structure. Her coat is tight curls (velcro for thorny bushes), non-shedding, and grows like zucchinis in August! She looks a lot like a poodle but her tail is pure retriever. She is fearless when it comes to water and such a cuddle-bug. Needless to say, she loves attention. Lucy treats her like her own baby and brings her bones and toys. We kennel-trained both, as well as obedience-trained. We had a private trainer come in the week we brought Syd home and she was extremely impressed by what a smart, observant dog Syd was. It was almost as if Syd could read human minds and figure out what was required. The trainer instructs guide dogs and remarked that Syd would easily train into that role. Syd loves cats and they love her fluffy, constantly moving tail. She's a dainty eater who loves rawhide, and especially wild strawberries and raspberries which she picks herself. She chases squirrels and has actually caught 2! The first one bit her on the nose while she was trying to figure out what to do with it. The next time instinct kicked in and she killed it immediately. Syd never allowed it to happen again. Syd also likes to dig for moles as you can see from one of her pictures. She makes quick friends with other cats and dogs, but is leary of strangers. Syd dances when she's excited about going for walks or rides and is a very good traveller. She pees on command but can't figure out why she should shake her paw! All in all, Syd is a very happy, playful, and silly girl that we love to pieces! We often talk about how lucky we were to get her after two others before us bowed out. She made Lucy a much calmer, mature dog. Thanks for everything and of course if you need anything else I'm always happy to gush about my girls! Joey (F1 Goldendoodle), big head, or no? -- you be the judge -- inset, from KD's and Dayo's December 2004 litter. I was once again snooping on your website and was quite sad to hear about KD?s early retirement. Joey from her 2004 litter has ended up being the best all around dog. Traffic stopping cuteness, mostly well behaved (still has this thing for tea towels hanging on the oven door), and he still keeps us giggling at his goofiness. He gets excited this time of year when the snow arrives and the temp finally cools down to his comfort level. I will send the word on KD?s availability and see if I can not help find her a deserving good home. Joey?s final weight ends up at ~57 lbs and ~24? at the withers (he did not like the tape measure too much so this is a rough guess) and no shedding. Somehow I think I could see Joey?s head getting bigger when I told him he is a limited production model, but then again it can just be his extra long hair catching the light funny. On a medical note... Joey had two bouts of ?hot spot?s? this summer. At first I thought it was ring worm but was reassured it was a common ?hot spot? (red rash thing). Both cases were caught early so it cleared up in 10-15 days but the poor guy had to wear a cone and put up with us cleaning his ?spot? and applying ointment daily. The vet recommended changing his food in case of possible allergies. So far so good. Take care and we hope all the best to KD and her new home. 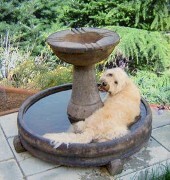 Emma (F1 Goldendoodle) pretends to relax for the camera :-), and inset, as Lucy, from Sally's and Jag's June 2005 litter. First of all I must apologize for being so late with pictures and poor quality pictures at that!! If you don't recognize Emma, this is Lucy from Sally's litter from last summer. She has been a welcomed addition to the family but a very active one. She does not have a relaxing bone in her body --- very busy. FYI, Emma has matured into about 30 lbs, has lost all of her puppy color and is all white. She is totally non-shedding and we suspect she is hypo-allergenic due to people we have been around. She is also very intelligent as she was totally house trained in approximately 2-3 weeks. Emma just got back from 47 days at the lake in Northern Saskatchewan. She is definitely a water dog and would swim out into the lake literally until you coaxed her back. Bad news though is that due to the water she was one big mat and had to be shaved down to the skin. 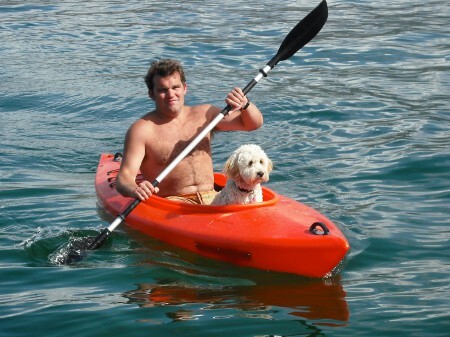 We were never sure how far she would go and would worry she may sink. She's also half kangaroo, she can jump both our 5' fence in town and get over our 5'6" kennel at the lake. All in all, she has been quite a character and we look forward to many years ahead. Reilly (F1 Goldendoodle) trying not to be cute for the camera, and inset, as Edmond, from Sally's and Jag's December 2005 litter. It was hard to capture Reilly's total cuteness. We are really enjoying him. He is sweet, smart and lots of fun and mischief. Reilly is learning everything so quickly. He aced his puppy class and we have signed up for puppy agility. You predicted his size, coat and temperament very well. Thanks for a great companion! 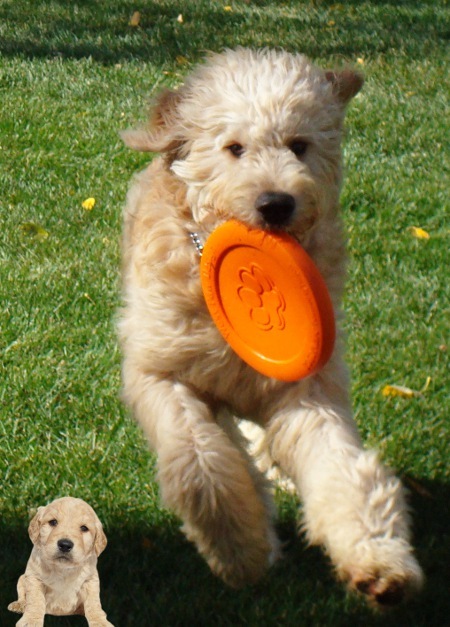 Willow (F1 Goldendoodle) works on her knawing skills, and inset, as Ariel, from Nia's and Dayo's March 2006 litter. I just wanted to give you an update on Willow. She has been just wonderful! We can't explain what a joy she brings to our family. Her fur is starting to look like it is coming in quite curly along her back and it looks to be the colour of her ears. She looks very different than her brother Jimmy (Goofy) who we bumped into at soccer on Tuesday. Jimmy and his family are moving into our neighbourhood in July. Small world! Jimmy's owner said that she is hoping that his fur will turn out like Willow's (fluffy) but right now it is much closer to his body with a few longer strands. 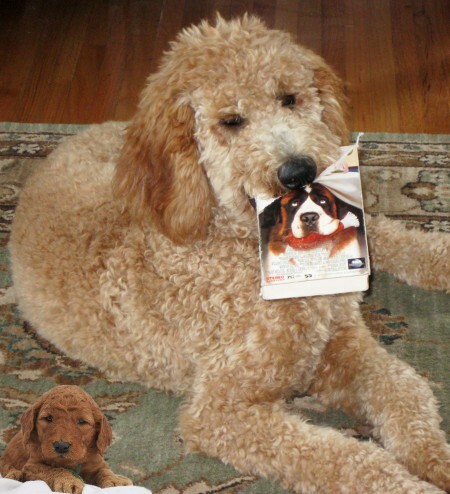 We actually thought that he was a Labradoodle at first but then found out that he is a littermate - WOW, what variance! Did they ever have a hoot playing together! Do you think that they recognize each other? Willow is at the top of her class at puppy school and the trainer says that your goldendoodles are the best. She is planning to get one of yours in the fall (she likes Dayo's pups). We are so pleased to hear such wonderful things about you. It confirms our initial feeling that you are a great breeder. I strongly believe that Jimmy and Willow should still know each other. Even a scent for us brings back memories. It is very often that when siblings meet they most always thoroughly enjoy each other's company. 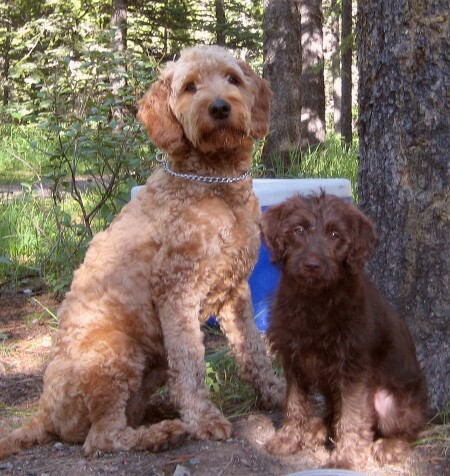 I had a couple of brothers in Calgary from Callie's litter who would look for each other in the off-leash park they frequented. Then they would romp and play like there was no tomorrow. It is very interesting to hear how all the coats are so different. But ultimately it takes a while for the pup coat to be replaced by their adult coat. Then you will know what you have after they reach about 10-12 months old. 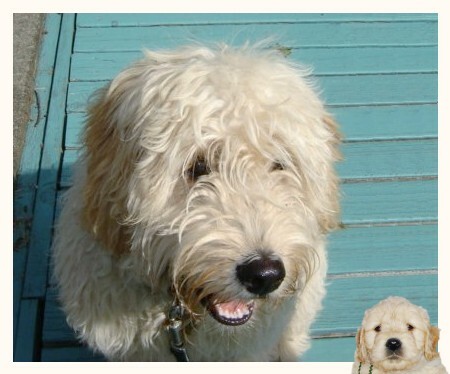 Chloe (F1 Goldendoodle) at 3 months poses with Amelie, and inset, as Lucy, from Sally's and Jag's December 2005 litter. Chloe graduated today and passed an exam on Puppy Training. She learns very fast and she knows now how to walk with a loose leach, how to sit for 1 minute... She is a wonderful dog. Chloe is really a member of our family. She loves to be outside and usually she does not walk in the flower beds. She lost one tooth last weekend and she is about 14 pounds. She is learning now how not to jump on people (the best is to tell her "no", she understands and sits nicely). She jumps quite high and she loves people. The interesting thing is that she understands commands in French and in English. 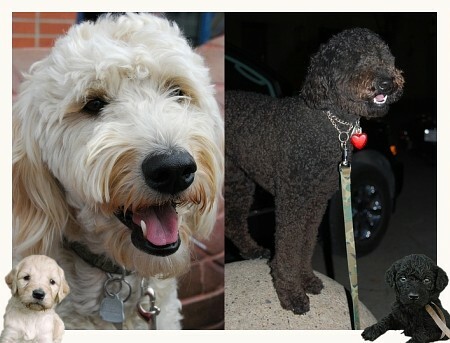 A very expressive Auggie (F1 Goldendoodle), and inset, as Luke, from Sally's and Jag's June 2005 litter. We just had Auggie shaved down so that he'll be cooler for the summer. You can guess what he thinks of his new do! 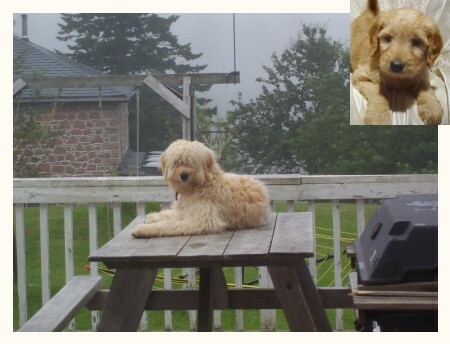 Winnie (F1 Goldendoodle) in New Brunswick, sitting on her favourite place in the world -- inset top, as Beth, from KD's and Dayo's December 2004 litter. Winnie's favorite place in the world is on top of the picnic table dreaming. She has spent a lazy winter of being indoors and out for short periods. We have tried to give some exercise in short bursts by playing the never-ending game of catch. We take her in the field next to the house and this smart girl knows to never go too far from us and never runs away. The winter has played havoc on her hair. She still does not shed at all but the wetness is causing tons of matts that we are trying diligently to stay ahead of. We never had any need in warmer weather to do her nails, but the salt on the roads and freezing temps here have prevented us from taking her. So her nails have grown and how she HATES to have them done... but she is getting better. We have a new grooming table built and that will make it easier for her. But I do love the fact she is really good in the bath. She has become extemely protective of the family, and especially mom, since she got hurt. She'll rough-house with us but not with Mom; she is Mom's baby. If people enter the yard she goes nuts -- if it is one of us, nothing but wags. The other night she roused everyone up at 1 am, something she never ever does. She was franatic and barking to get outside. We let her out and we heard people running from the shed house (it is another little house on the property where most of Dad's tools are kept under storage). She barked and walked along the perimeter for a while and happily came in. Then we found out there were a string a garages broken into that night. What a blessing she is!! Everyone feels so safe with her home. Her piddle problem is almost gone. She still will chew something if she gets bored and is unattended, but she is getting more and more trustworthy. Her newest and funniest quirk now is to sit on one stair in the kitchen and with her feet on a lower stair. It looks so funny. As straight as her hair is, it just grows and grows. She does have an undercoat which I rake out occasionally to keep her looking good. I bought some professional quality clippers and some comb attachments and I am going to shorten her coat slightly for the warmer weather. People just love her, no doubt about that. 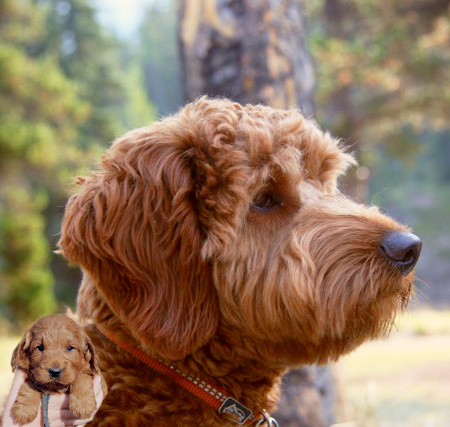 Auggie (F1 Goldendoodle) paying a visit to his birth home with his brother Mr. Beaver -- inset, posing in the tree as Luke, from Sally's and Jag's June 2005 litter. Auggie has mellowed out quite a bit in the last little while. He loves a game of chase and fetch, and he gets to go to the off-leash park on weekends and doggie daycare at least once a week to burn off his extra energy. He is still a very friendly, outgoing, little pup who just loves belly rubs. Whenever he sees people (especially kids) his tail wags so much his bum swings side to side. His goofy personality is coming out quite nicely now. He still has the occasional growling incident when he doesn't want to move, or sometimes when we take something out of his mouth (only if we don't take it away from him fast enough -- if he has time to think about what we're going to do then he decides that he wants to protect his treasure). He was neutered in October when he was 4 months old at the recommendation of the vet. After seeing some of the other dogs at the sessions we go to with the behaviourist, Auggie is not bad, just a bit on the dominant side. Everyone says he's really smart -- a little too smart for his own good. I'm thinking he might do well in agility since he can now jump higher than the counter, loves to run (both inside and outside of the house), and learns very quickly. His fur was really curly, but it's starting to come out as a loose curl now. It's great that he doesn't shed! Auggie is a bouncy 22 lb ball of energy that we absolutely love! We had fun when little Luke (now Auggie) came to visit us for a few days. He was the smallest of Sally's and Jag's June 2005 litter. He was gentle and sweet and full of play. He loved playing with Mr. Beaver, his brother, the best. 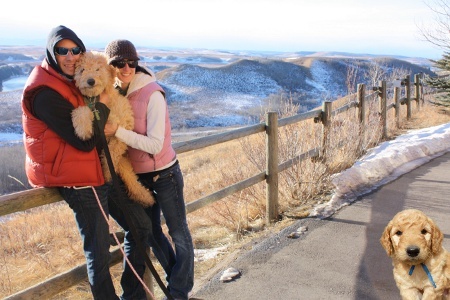 Auggie's family had never owned a dog before and have experienced many joys and challenges. One challenge with Auggie is him guarding his favourite toys. But they continue to work with him and remind him that "they" are the alpha whenever he "pushes the envelope". 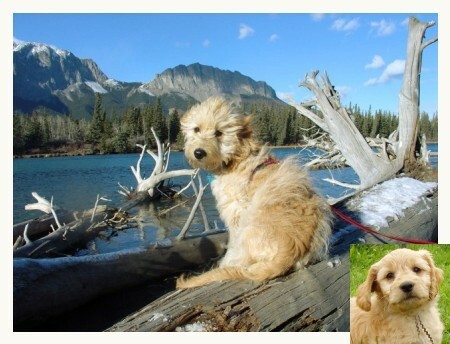 Fogo (F1 Goldendoodle) loving life in the Kananaskis mountains -- inset Fogo, as Fetch at 7 1/2 weeks, from Sally's and Jag's June 2005 litter. 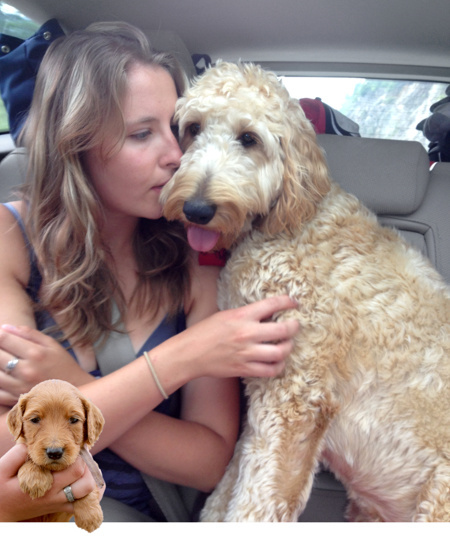 Thought we'd update you on how your goldendoodle litter is turning out from June 14th. This is Fogo (Fetch) loving life in the mountains. He's a great dog. Loves to hike. He's also in puppy classes now and doing very well. Very smart and everyone loves him. We also took him to Victoria, BC last weekend by plane. He traveled very well and adapts to different environments quickly. I think you're onto a winning combination. 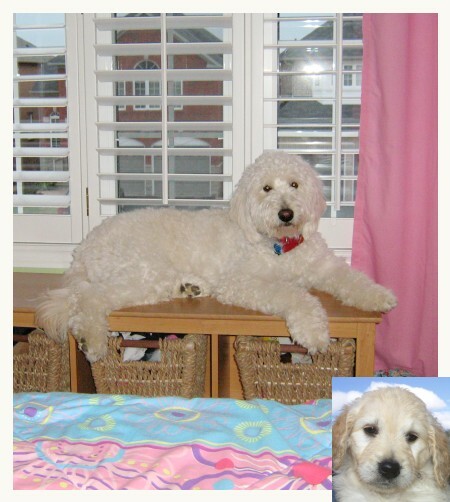 Ruby (F1 Goldendoodle) (Mary from KD's and Dayo's December 2004 litter) at 5.5 months -- insets, at 7 months before, and after, the big clip. Ruby is a non-shedder and went to a home where the father is very allergic to most dogs, but not to her. They spent a considerable amount of time with 3 washed pups in their van, one at a time. He didn't seem to react as much with Ruby and all is well. This is a wonderful story but it doesn't always turn out this way. 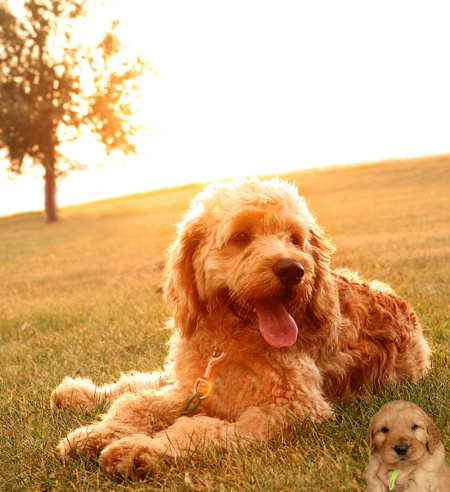 Goldendoodles are generally better candidates for allergy sufferers, but it all depends on the allergy and the pup they choose.